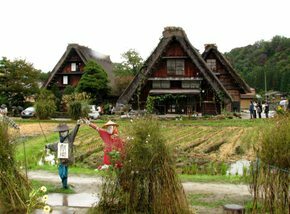 Staying in Takayama, we made a bus trip to Shirakawa-go village, to see Japanese traditional houses and the countryside. It was a cloudy and rainy autumn village, but still a beautiful place. Shirakawa-go is situated at the foot of Mt. Haku-san in northwestern Gifu Prefecture. It is a quiet mountain village with rice fields and a river running through it. 114 thatched roof stand together in the village, which was registered as a UNESCO World Heritage Site in 1995. 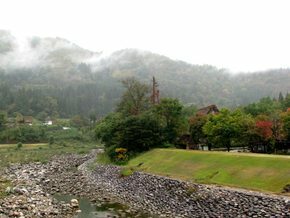 One of the snowiest places in Japan, 95.7% of Shirakawa is covered by forests. Shirakawa Village and its surrounding area are a moderately inhabited province, featuring some of the heaviest snowfall found not just within mainland Japan but the whole world. Yearly average snowfall amounts average out in excess of 10 meters (415.4") with snowbanks developing well over 2 meters tall. As a consequence of the frequent heavy snow, characteristically thick thatched roofed houses are a cultural heritage of this village. 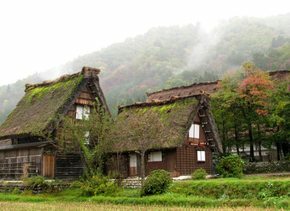 The village is famous for the traditional gassho-zukuri farmhouses, some of which are more than 250 years old. Gassho-zukuri means "constructed like hands in prayer", as the farmhouses' steep thatched roofs resemble the hands of Buddhist monks pressed together in prayer. The architectural style developed over many generations and is designed to withstand the large amounts of heavy snow that falls in the region during winter. The roofs, made without nails, provided a large attic space used for cultivating silkworms. A number of farmhouses from the surrounding villages have been relocated to an open air museum across the river from the town center in an effort to save them from destruction. Gassho-zukuri Minka-en outdoor museum is made up of 27 thatched roof houses that have been relocated from various areas in Shirakawa-go. A temple, a coalhouse, and a horse paddock have been built, preserving the old scenery. There are live performances of traditional industrial arts like dyeing and weaving, and visitors can even try making these crafts themselves. At the "Soba Dojo," guests can experience making Japanese soba noodles.